Sarah Dessen is one of my Favorite YA contemporary authors. That is a very.... very small list. So she should be honored ;) She is on my list of "I will read ANYTHING this woman writes" authors. That's why I picked up The Moon and More. It didn't intrigue me quite as much as my favorites from her ( Lock and key, The Truth About Forever and Just Listen ) But I was like... Dude... It's SARAH DESSEN. I think I hyped it up a bit much for myself. While I still really enjoyed The Moon and More. I didn't love it. It fell a bit flat for me and I was CONSTANTLY annoyed with the " Love interest " Blech.. Blech.... and more BLECH. But ya know... To each their own. He was just annoying and obnoxious. Over the top and just... really unlikeable to me. I understand that for Emaline it was new and exciting, But within the first few interactions with him I was personally like " Please Emaline.. no, just no." I enjoyed the parts of this story that were NOT about Theo. I adored Emaline's little brother with his "can do" attitude. I kind of remember being his age and thinking how much I wanted to help out and rushed to be the first one to offer. He was just a super endearing character and he took his family problems in stride, as much as a preteen could. I loved that the main family was a step family, and a HAPPY one. The family dynamic was fun and honest, not always perfect, but still full of love. I really connected with this part of the story, which also made the relationship with Emaline and her " father" tough for me as well. It's hard not to want some kind of relationship with your biological father if he has never really done anything to hurt you. It's not like you as the child have much of a say in his leaving, or how much he is around. I liked how Sarah Dessen tackled this part of the story. Her father isn't portrayed as a bad guy, or the good guy "done wrong" he is just there. Being himself, the good and the bad. Click on the images to be taken to the books Goodreads page! I've been waiting to read this one! 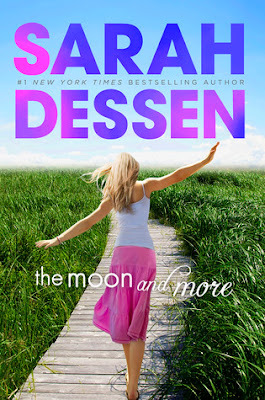 However, I'm not a big Sarah Dessen fan but the cover draws me in! Great review!